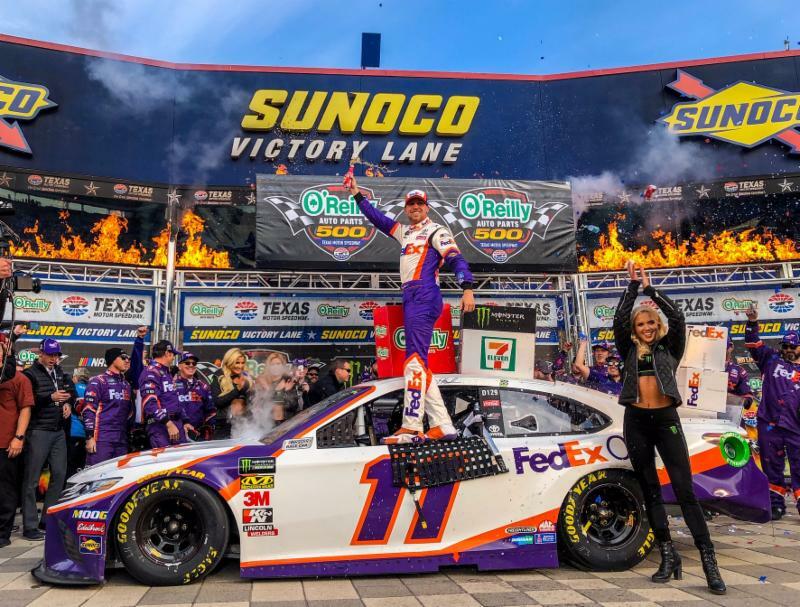 FORT WORTH, Texas (March 31, 2019) – Denny Hamlin says he and crew chief Chris Gabehart are “plugging away” at the revised 2019 rules package for the Monster Energy NASCAR Cup Series. Hamlin rallied to score the 33rd win of his Cup career by 2.743-seconds over Clint Bowyer of Stewart-Haas Racing in the 23rd annual O’Reilly Auto Parts 500 at Texas Motor Speedway. Hamlin passed pit road while running on fumes, then was penalized for speed too fast on his ensuing stop on Lap 64 during Stage 1; used a gas-only pit stop under green to gain track position en route to his Stage 2 victory at Lap 170 before incurring an uncontrolled tire penalty entering the Stage 3. Hamlin opened the 2019 season with a victory in the Daytona 500 _ NASCAR’s Super Bowl _ after going winless in 2018. Gabehart insisted he and Hamlin haven’t “optimized” their program after seven of 36 events. “That’s encouraging now,” Gabehart said. “You’re racing against the best teams in the world. It’s difficult to have a flawless race. It’s not an easy thing, It’s one thing to identify, it’s another to fix it. That’s something we got to work on. Rounding out the top-10 were JGR’s Daniel Suarez and Erik Jones, pole-sitter/seven-time Cup champion Jimmie Johnson of Hendrick Motorsports, William Byron of HMS, Aric Almirola and Kevin Harvick of SHR, Kurt Busch of Chip Ganassi Racing and Kyle Busch. The winner of Friday night’s Gander Outdoors Truck Series and Saturday’s Xfinity Series races, “Rowdy” Busch saw his bid for a third tripleheader weekend sweep sabotaged by a brush with the wall exiting Turn 2 on Lap 276 of the scheduled 334.